A special uniform for Navy flight nurses was first issued in January 1945. It consisted of a battle dress jacket, slacks with side pockets, a shirt and a baseball type cap. 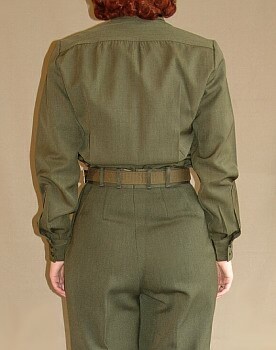 In addition, a garrison cap and a skirt were authorized. 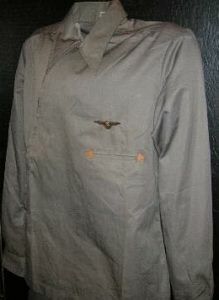 The uniform was available in gray cotton for summer and green wool for winter. The winter uniform was the same green color as the Navy pilot’s winter uniform. .v..v The shirt had a zipper that angled up from the garment bottom to close at the neck. The upper pocket closure on the left side had reinforcing leather triangles at both ends. Appropriate rank and Navy Nurse Corps insignia was worn on the collar, and naval flight nurse insignia was positioned above the left pocket. 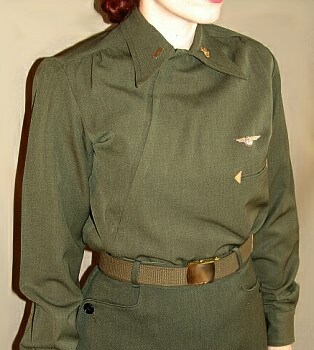 The battle dress jacket had a single-breasted style with a fly front and two patch style pockets having buttoned flaps. Black stripes on the sleeves designated the rank. The Naval Flight Nurse Aviation Insignia was pinned above the left pocket. 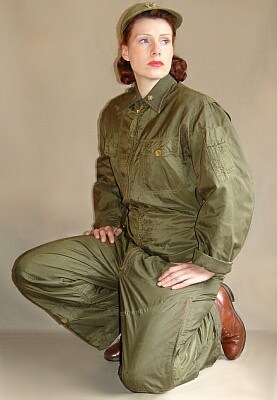 .... A green nylon coverall identical to that worn by naval and marine pilots was sometimes used for fatigue duty. 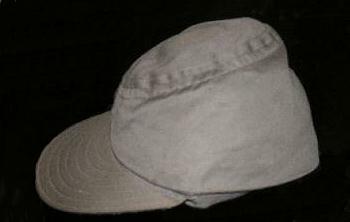 It was worn with a baseball style cap. 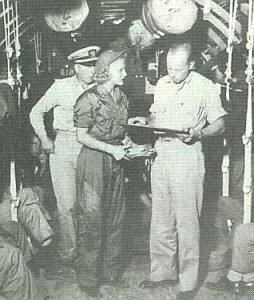 Navy Flight Nurse reports to a physician after air evacuation flight from Okinawa to Guam in 1945. She wears the nylon fatigue coverall with a baseball cap.